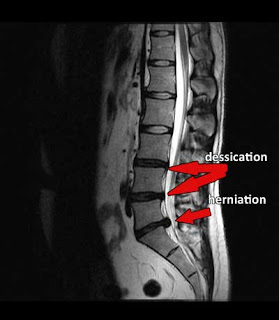 Non surgical spinal decompression is very different from lumbar traction. Traction is basically a stretching of your spine. Decompression creates a vacuum effect in the spine. It has a traction component to it so it stretches your spine slightly opening up the nerve holes but it also suctions the discs back in place. Over a sequence of treatments the disc is then able to stay in place keeping the spinal canal and nerve canals free of interference. In our office we use the Drx9000 and with this protocol a patient wears an upper and a lower harness. This effectively takes the muscles out of the equation, so we can focus on the disc level. You see, traction will often give some short term relief but soon after treatment gravity takes hold again and the spine squishes back to where it was. Also, when traction pulls its often a straight linear pull that may cuase the muscles to spasm and prevent the adequate stretch. Whereas, decompression pulls in a cyclical fashion (pull and relax, pull and relax). In addition there is a feedback mechanism which can detect muscle spasm. If there is spasm the machine relaxes the pull; when the muscles relax it can pull again. Because of these features the Drx9000 Spinal Decompression device will pull at much more force then traction but because it keeps the muscles and ligaments relaxed, not only will it feel comfortable it is able to create decompression or in others words suction the disc back into place.